Perpetual Prototyping in Schools — Wonderful Idea Co.
As we develop new workshops and exhibits, it's been really important to work with collaborators across different settings to get feedback and brainstorm new possibilities. Over the past few months we've been working on a few interesting projects with a couple of innovative schools in the Bay Area to develop prototypes before sharing them more widely with the field. The first partner that we're working with is Lodestar Charter School in Oakland. 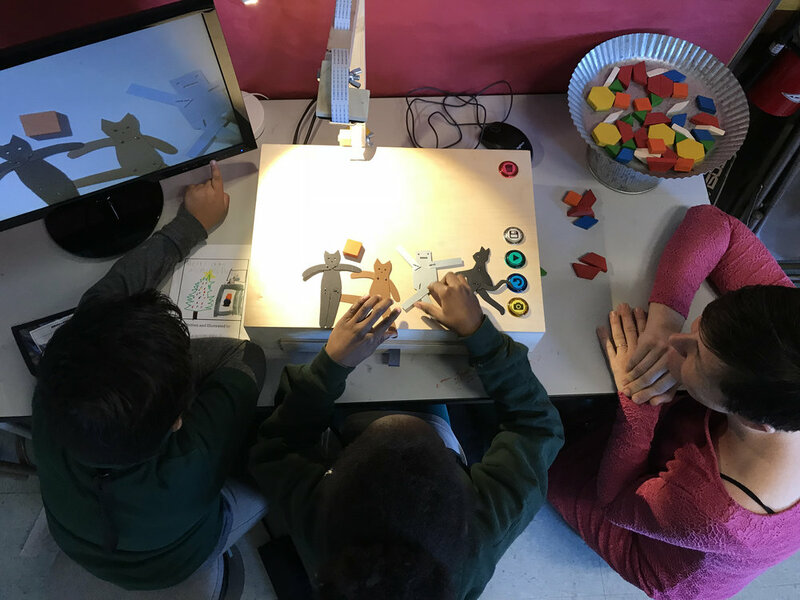 In December, we tested out a stop-motion animation station "micro-exhibit" that might be used in schools, small museums, libraries and makerspaces. We set up a little station for students to use during a semi-unstructured making time. They worked in groups of twos or threes and made quick animations using posable paper cats and colorful geometric shapes. A couple of things that we noticed was that it took the students a few minutes just to explore animation techniques. It felt important to give them a chance to simply move things out and experiment first. As well, it was interesting how much the kids were talking through their stories, making up dialog and explaining the motivations of their characters. We started thinking about how this activity could be supported both by writing, drawing and storytelling before the activity. As well there are possible additions we could make to the exhibit that would allow students to record their voices or write subtitles. Overall, it was a really nice test and we're hoping to get funding to continue exploring this mini-exhibit and other workstations to be used individually by students or integrated into classroom units. Another project that we've been working on, is a collaboration with the Contemporary Jewish Museum. We're building elements to support school groups to build their own chain reaction machines inspired by the new exhibition of Rube Goldberg's cartoons. This project has inspired several schools in the Bay Area to expand on the experience and create longer term projects around chain reaction. In one of these projects, teachers at the Brandeis School of SF enlisted our help to develop a program where students design and build their own Rube Goldberg machine. Last week, I visited the elective for the first time to engage the students in tinkering with physical materials. We started by playing around with circuit boards with a traditional set of batteries, lights, toy parts, and switches. In the second half of the session, students brainstormed homemade switches that would send an alert when something happened. Ideas included little-sibling proofing bedrooms, booby trapping water bottles and imaginative burglar alarms. A couple groups created trip wires and it was fun to see how different groups used alternative materials to solve the same problem. Other groups focused more on the mechanisms and created switches that alternated the sound of buzzer because of a moving connection point. There was a lot accomplished in the two hour session and I think that this hands-on experience will encourage outside the box thinking when they begin to make their own chain reaction machines. This was my first time experimenting with the circuits and storytelling prompt and I learned a lot by watching the participants and reflecting with the teachers. It's been fun to work with partners interested in the process of making and tinkering. Together we're constantly tweaking, adjusting and reflecting on the workshops and exhibits. This work will lead to better and more engaging experience that we can share further.